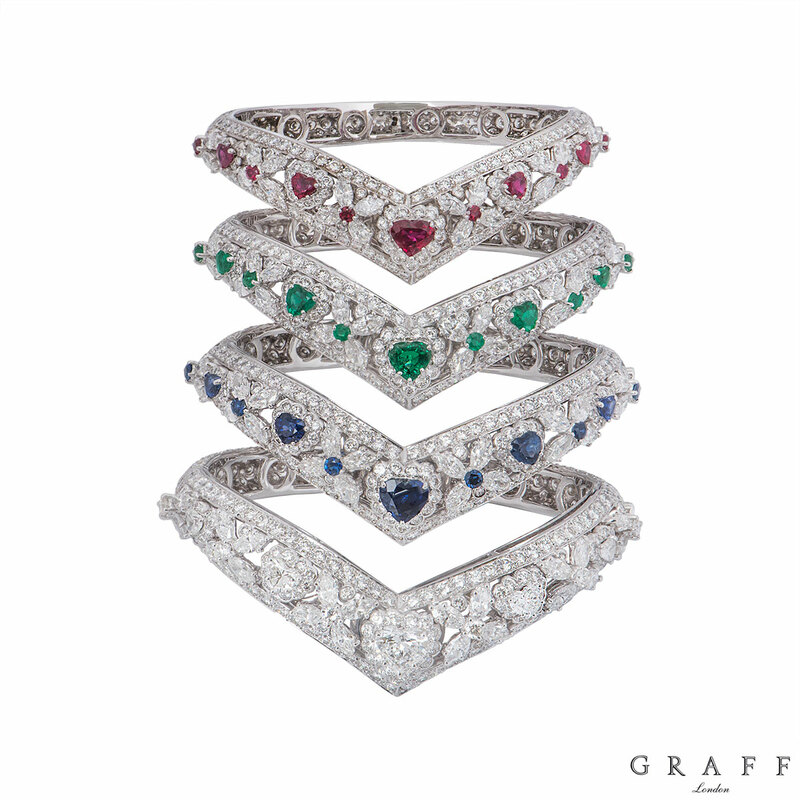 A striking set of 4 diamond and gem set bangles in 18k white gold by Graff. 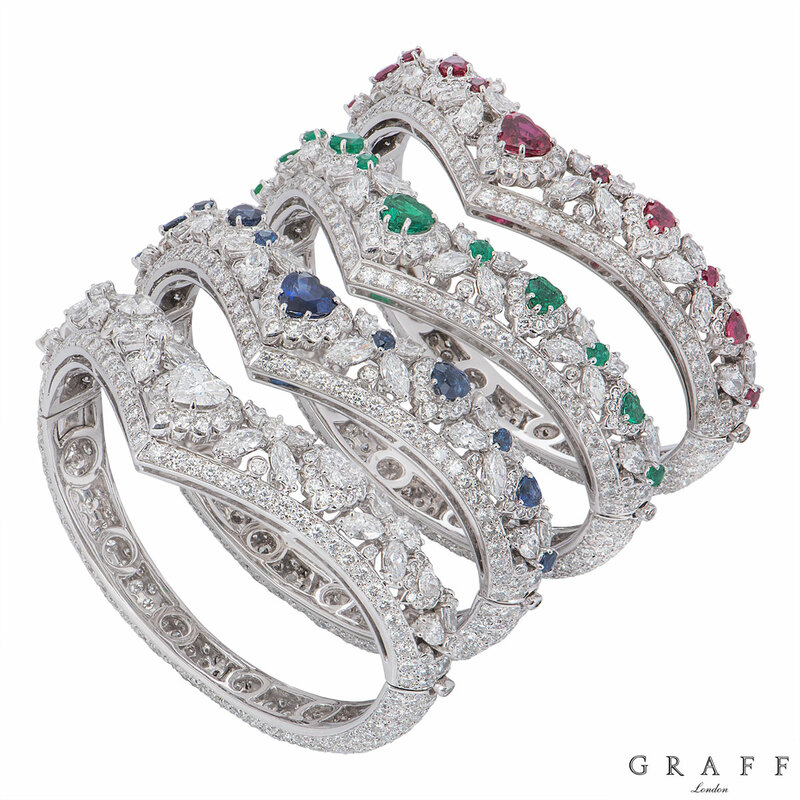 The first bangle - 18k white gold set with diamonds and rubies to the front v shape motif. 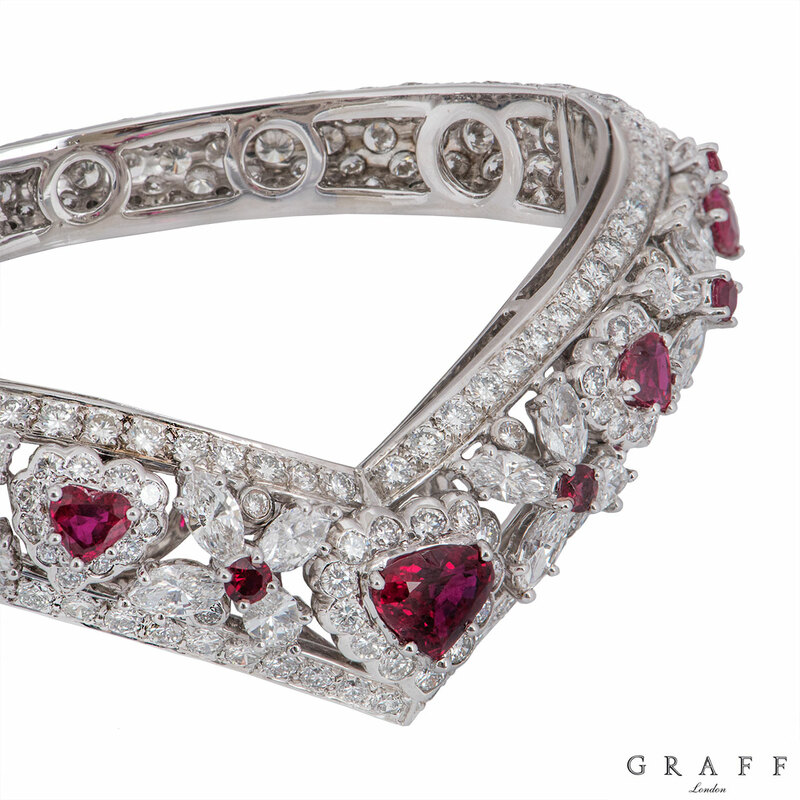 The bangle features 5 heart cut rubies, separated by marquise cut diamond flower motifs with 6 round cut rubies in the centre. 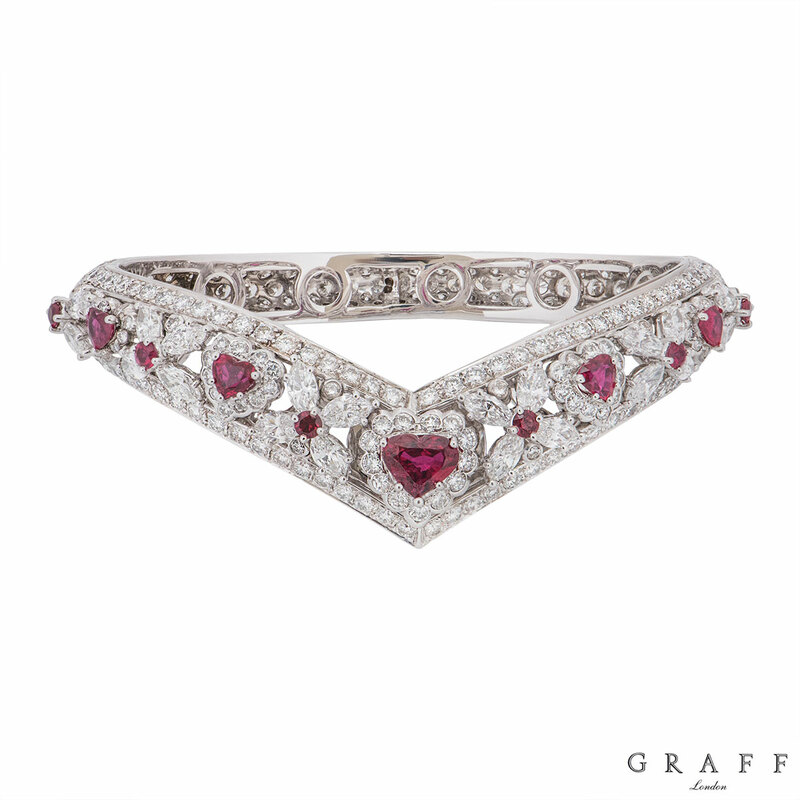 The rubies have an approximate total weight of 2.50ct and display a deep red hue. 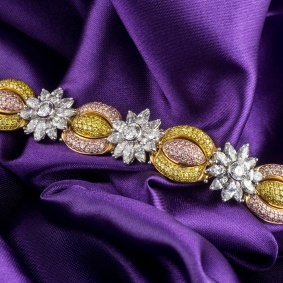 The diamonds have a total weight of approximately 19.00ct and are predominantly F+ colour and VVS in clarity. 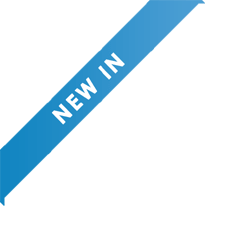 The front of the bangle measures 15mm in width and tapers down to 7mm at the back. 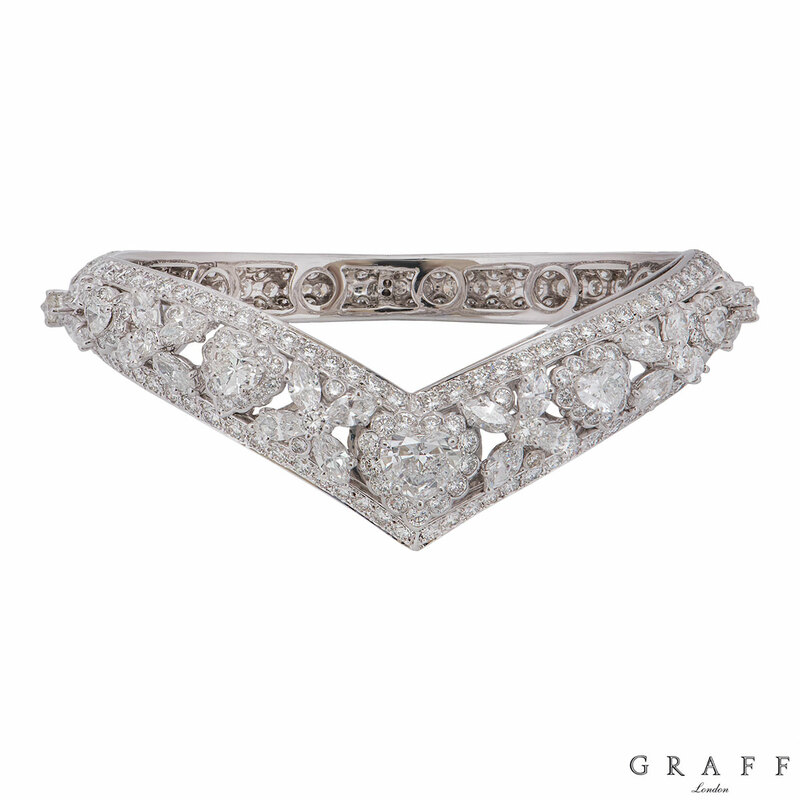 The bangle has a discrete tongue clasp set with a single diamond and has a gross weight of 43.62 grams. 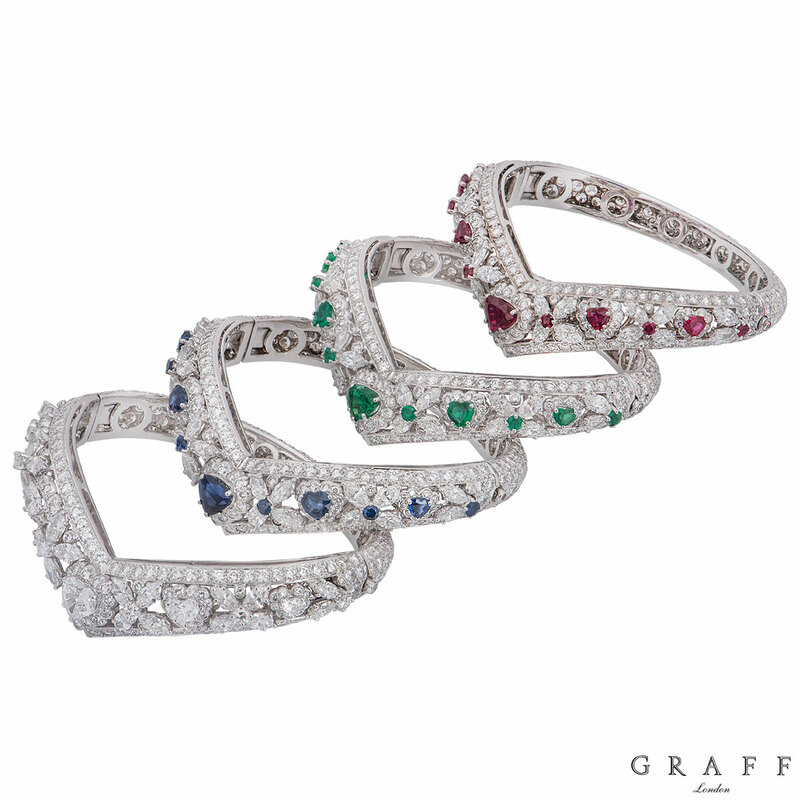 The second bangle - 18k white gold set with diamonds and sapphires to the front v shape motif. 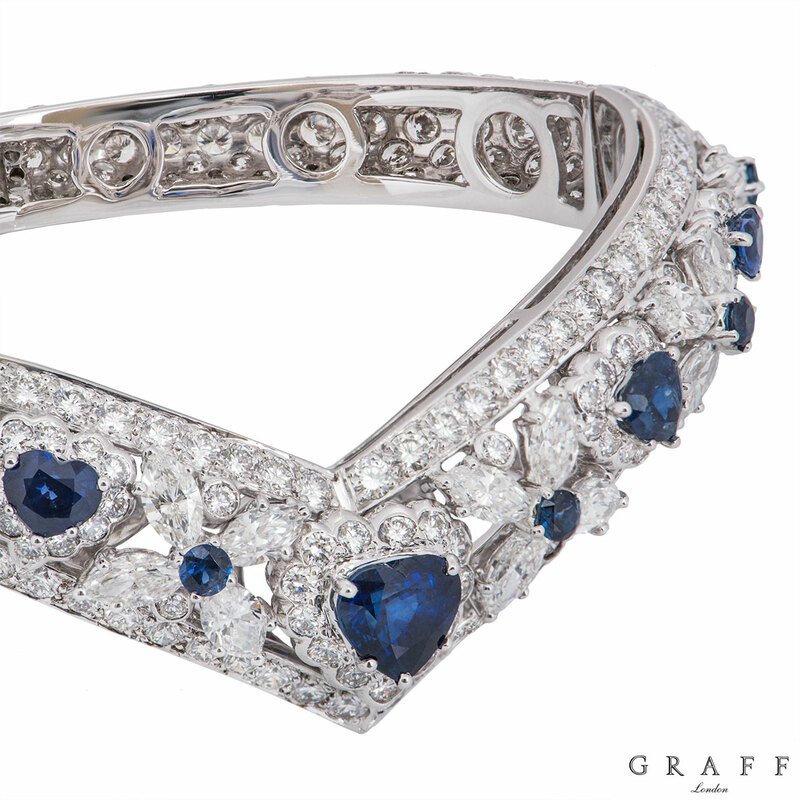 The bangle features 5 heart cut sapphires, separated by marquise cut diamond flower motifs with 6 round cut sapphires in the centre. The sapphires have an approximate total weight of 2.50ct and display an even blue hue throughout. 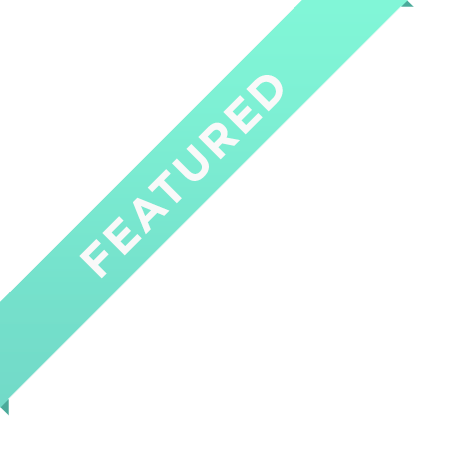 The diamonds have a total weight of approximately 19.00ct and are predominantly F+ colour and VVS in clarity. The front of the bangle measures 15mm in width and tapers down to 7mm at the back. 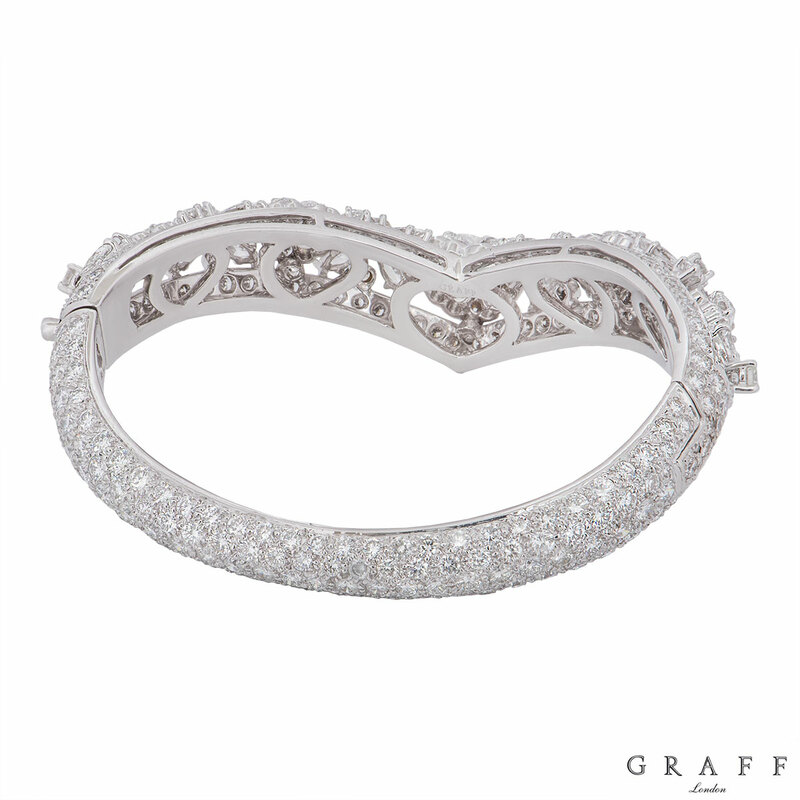 The bangle has a discrete tongue clasp set with a single diamond and has a gross weight of 43.40 grams. 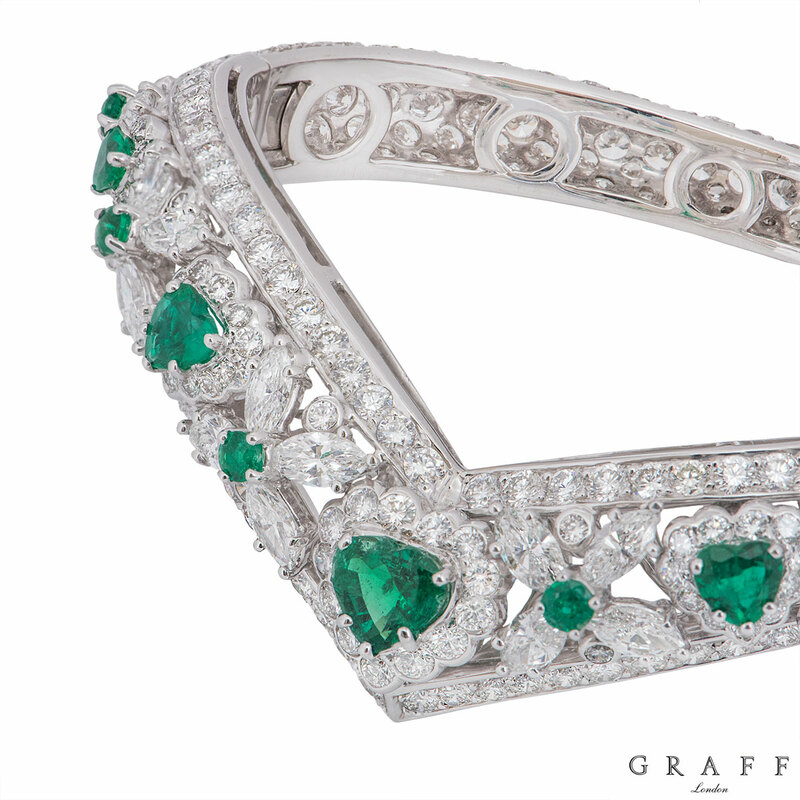 The third bangle - 18k white gold set with diamonds and emeralds to the front v shape motif. The bangle features 5 heart cut emeralds, separated by marquise cut diamond flower motifs with 6 round cut emeralds in the centre. 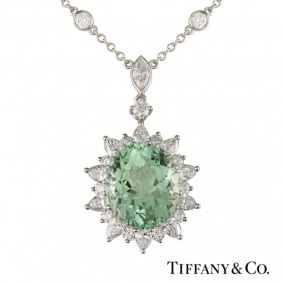 The emeralds have an approximate total weight of 2.50ct and display a rich even green hue. 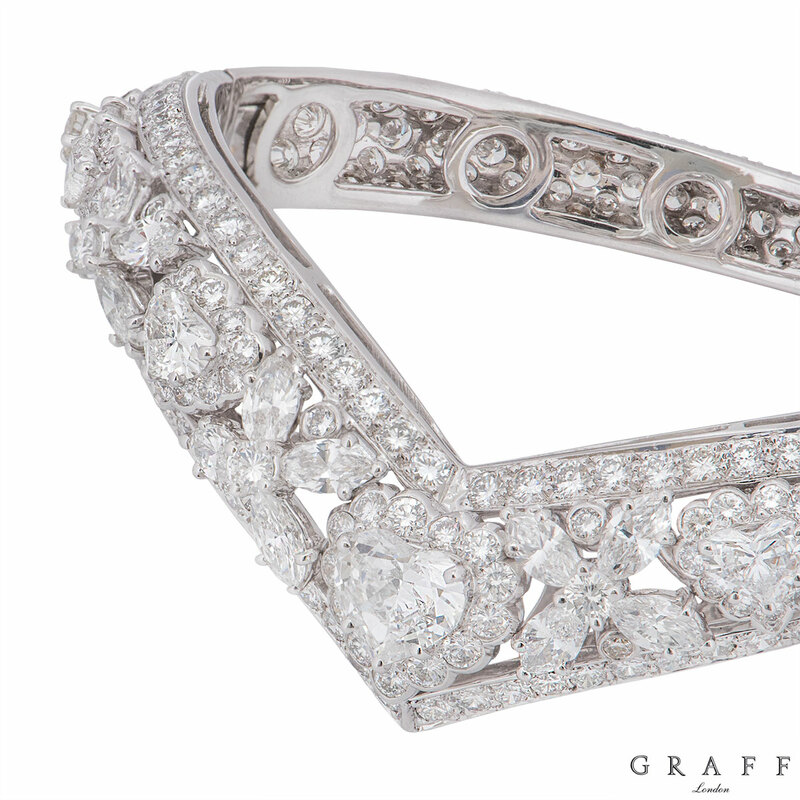 The diamonds have a total weight of approximately 19.00ct and are predominantly F+ colour and VVS in clarity. The front of the bangle measures 15mm in width and tapers down to 7mm at the back. 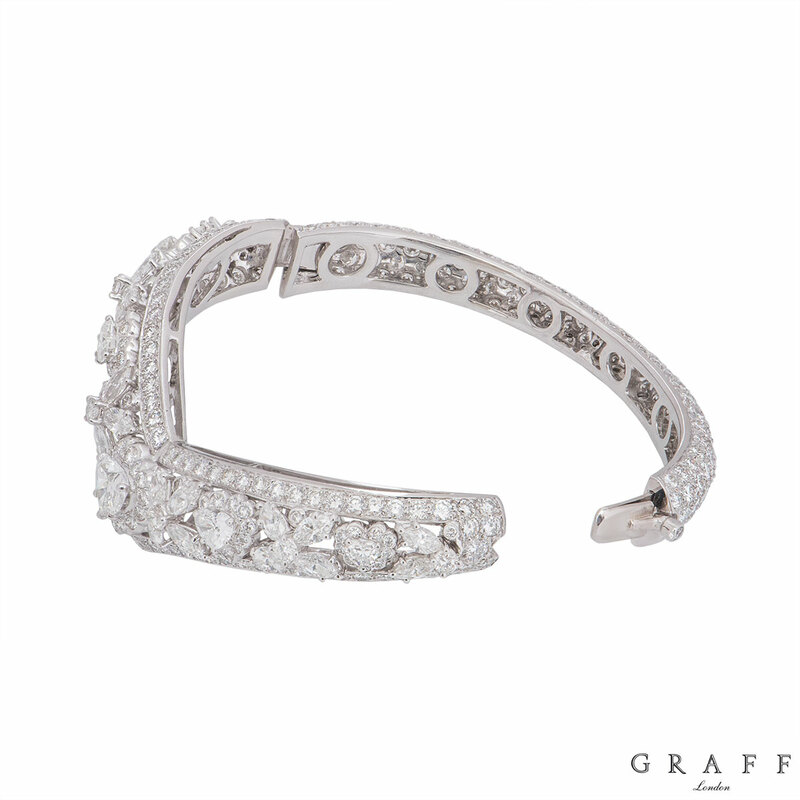 The bangle has a discrete tongue clasp set with a single diamond and has a gross weight of 44.37 grams. 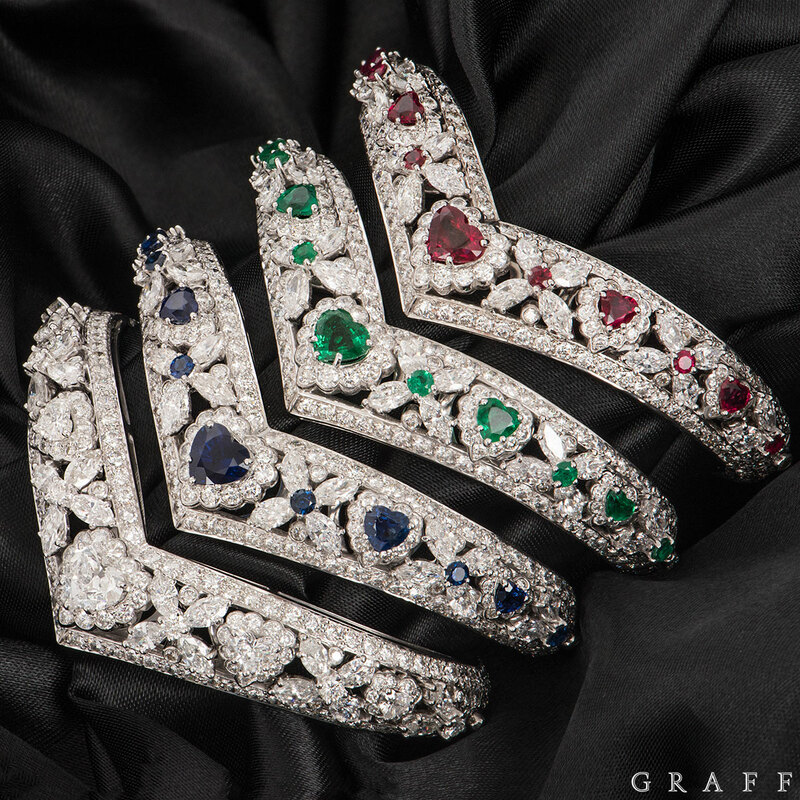 The bangles come complete with a RichDiamonds presentation box and our own certificate of authenticity.